I was very excited to be able to share the full and complete story with Bookworm1 this year. At age 4 1/2 he seemed ready to be able to understand and thrill in the story I love so much: The Lion, the Witch and the Wardrobe . 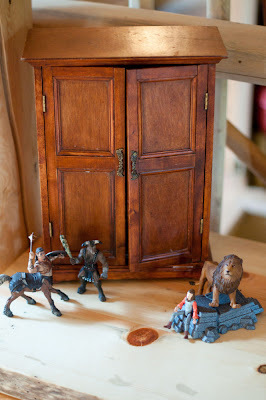 We've spend plenty of time with Narnia picture books and we've watched video clips of the movies (the parts without any curiously disturbing mythological creatures) and we'd even made it a few chapters into the real book a time or two. This year I thought he could handle the story in its entirety and so we read it. And we loved it. Both of us. * I found this doll's wardrobe at Goodwill and thought it was PERFECT for Narnia play! Lucy and the Stone Table were gifted to us (by my brother) and the other figures are Safari Ltd. items. I confess that I am completely unable to read the Narnia series without reading stuff into it. I walk away from each adventure with practical life applications and this read through was no exception to me. I did discover that it is a lot harder to read the books outloud because I find them so deeply meaningful and impacting that I spent the later half of the book trying not to sob my eyeballs out while reading to him. He kept glancing over at me while I was reading about Aslan coming back to life and playing with Susan and Lucy. I read the following passage which seemed to have the greatest impact on both of us and I'll explain why in a minute. "Oh, children," said the Lion, "I feel my strength coming back to me. Oh, children, catch me if you can!" He stood for a second, his eyes very bright, his limbs quivering, lashing himself with his tail. Then he made a leap high over their heads and landed on the other side of the Table. Laughing, though she didn't know why, Lucy scrambled over it to reach him. Aslan leaped again. A mad chase began. Round and round the hill-top he led them, now hopelessly out of their reach, now letting them almost catch his tail, now diving between them, now tossing them in the air with his huge and beautifully velveted paws and catching them again, and now stopping unexpectedly so that all three of them rolled over together in a happy laughing heap of fur and arms and legs. It was such a romp as no one had ever had except in Narnia, and whether it was more like playing with a thunderstorm or playing with a kitten Lucy could never make up her mind. And the funny thing was that when all three finally lay together panting in the sun the girls no longer felt in the least tired or hungry or thirsty. "And now," said Aslan presently, "to business. I feel I am going to roar. You had better put your fingers in your ears." Mommy: *sniffling* "This is my favorite part." A little while later I was in the other room with the baby when I heard a great deal of roaring going on in the living room. 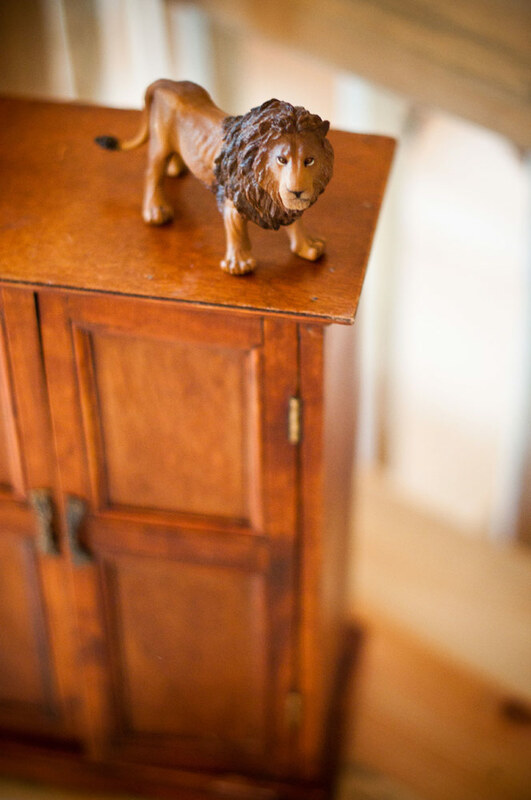 I walked into the room with the boys to discover Bookworm1 holding on to the lion figurine, with Lucy on top, roaring and running around the room. My heart warmed. I love seeing Bookworm1 engaging with powerful stories. He has reached the age where he does mimic certain of his favorite movies or his favorite books and so I've begun to realize the great importance of filling his mind with good and noble adventures that will stir both his heart and his passions towards Christ. He is making memories and acting out what is being placed inside of him and I hope that a love for Narnia and story grows in his heart. It is such a pleasure to share Narnia with him and I hope he remembers these first moments inside this magical land. The story ended with a huge smile on his face and mine. I too have a hard time reading these stories without getting debilitated by the emotion. It happens at the creation of Narnia in 'Magician's Nephew' too. And in other places... I can think of scenes that stab me in every book. Incidentally, my girls and I watched the movie version a few days ago, and my 7-year-old pointed out something I'd never noticed before: the white witch wears Aslan's mane into the battle. Oh to have her powers of observation! Wonderful that your young man is getting acquainted with the real deal. Such fun! I so wish I had read these to my kids. I'm hoping to get the youngest to read the book this summer. I just love the way your love for these books comes through! I'm so glad you're getting to share with your little one--that's one of the best things about being a parent. We had "The Lion, the Witch, and the Wardrobe" as our family read-aloud when my son was 6yo. I had told him we had to read the book before he could see the movie. We were racing to finish it so we were trying to read a chapter a night. Those were some long chapters! I think I lost my voice. I'm thinking of getting the whole set of books on cd for my son for Christmas. He's more likely to get around to the rest of the books that way! Oh, I so relate to this, Carrie! I read the chapter in which Eustace is "un-dragoned" in Dawn Treader today to the girls, and yep, I cried. Oh, beautiful! I haven't yet read these with my youngest (5), but you give me hope that maybe he's ready. We read the series with my oldest when he was 7 or 8 and it was so enjoyable for all of us. Oh, this just makes me happy! I'm so glad your son is enjoying The Lion, the Witch and the Wardrobe. 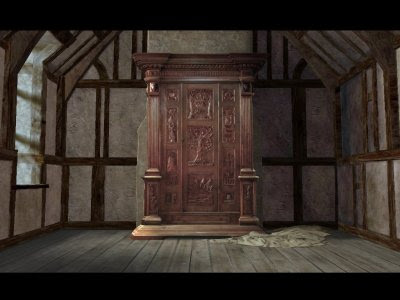 My first intro to Narnia was when my mom read The Lion, the Witch, and the Wardrobe aloud to me, my older sister, and my next younger brother. Anna and I (at six and five) loved it, but tender-hearted Joshua (four) had a hard time with the White Witch and Edmund (long before she starts talking of killing him.) It hasn't staunched Josh's love of Narnia though--just delayed his entry through the wardrobe a bit longer. My grown kids still have fond memories of me reading the Chronicles to them. You're making wonderful memories! My review is of a C.S. Lewis book too...hope you'll stop by!